A reliable source for Adjustable Workbenches information and a resource for accessing leading Adjustable Workbenches and suppliers. An adjustable workbench can come in handy in a setting where an unusually high working surface is needed, or where a work station below waist-level would be useful. 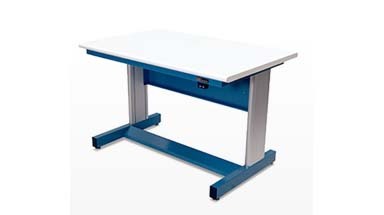 Some adjustable workbenches have two large legs attached to a wider base. These legs are made out of metal (usually steel) and are built using two parts so that they can slide up and down to adjust the height. Other adjustable workbenches look more like a conventional table because they have four legs. Usually these four legs each have an extendable portion on the end that can be retracted or pulled out to lower and raise the workbench. Adjustable Workbenches An adjustable workbench can come in handy in a setting where an unusually high working surface is needed, or where a work station below waist-level would be useful. Locks can also be installed to secure any items stored in the workbench. 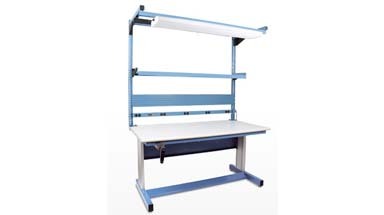 Manufacturers of adjustable workbenches sometimes integrate extra features like electrical outlets or an overhead work light to provide a more efficient work space. The surface of an adjustable workbench is either made from a thick piece of finished wood, or a thick sheet of metal. The frame is usually built using stainless steel with parts that are welded together during manufacturing. Some adjustable workbenches also have caster wheels attached to the legs to make them mobile. Mobility is important in temporary workspaces or facilities where work demands change frequently. Adjustable workbenches can be built for a wide range of industrial and commercial settings, and they are designed with different weight capacities. A heavy-duty workbench could withstand the weight of thousands of pounds, while a more basic light-duty model may only be capable of holding a few hundred pounds.